The RU1022AM RocketU Dual USB 3.0 for Mac from HighPoint Technologies is a host adapter providing upgrades to your current USB ports. With the RU1022AM you can now take advantage of USB 3.0 connectivity along with 5Gb/s transfer speeds. 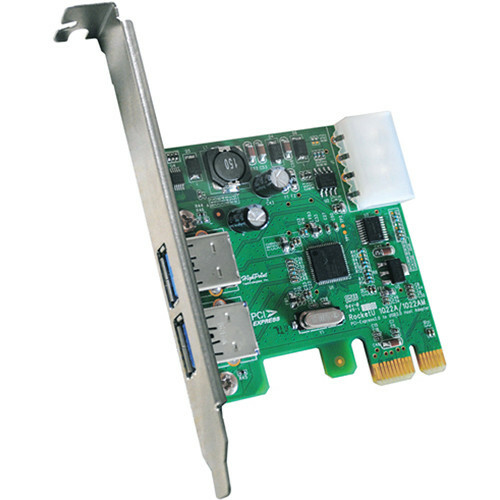 The adapter is PCI-E compatible offering numerous improvements over traditional bus standards. With the PCI-E compatible device you can receive higher maximum system bus throughput, more detailed error detection and reporting mechanism, and native hot-plug functionality. The RU1022AM is also Hot-Swap and Hot-Plug compatible. With hot-swap compatibility you can easily replace the adapter without the need to shut down you system. Along with hot swapping, you can also hot-plug your adapter into your system. Hot-plugging your adapter simply means you can add the adapter to your system without significant interruption to the operation of your system. Once inserted and the necessary software is installed the device becomes operable without the need to reboot your machine. With 5Gb/s transfer bandwidth you have the speed you need to transfer a variety of files. Peripheral Component Interconnect Express or, PCIe, includes a number of improvements over the older bus standards traditionally used in computers. With PEIe standards you can take advantage of higher maximum system bus throughput, lower I/O pin count, better performance-scaling for bus devices, a more detailed error detection and reporting mechanism, and native hot-plug functionality. The hot swappable RU1022AM controller benefits from hot swapping technology. When a device is hot swappable it can be replaced without shutting down the computer. When you hot swap your device you can replace the component without significant interruption to the system. This device is also hot-plug capable enabling you to expand you system without significant interruption to the operation of your system. Box Dimensions (LxWxH) 7.7 x 6.9 x 1.4"
RU1022AM RocketU Dual USB 3.1 Gen 1 for Mac is rated 2.9 out of 5 by 14. Rated 1 out of 5 by marzipan from Doesn't work with SD/CF card readers After reading conflicting reviews, I thought I would give it a try. Yes. It's official - this card does not support the use of SD/CF card readers on a Mac Pro. After contacting Highpoint Technology, that's the word back, despite product descriptions on some sites saying it does - and what's really strange is the review below saying it works. Very odd. The reader will only function, in a limited fashion if you unplug and replug in the reader to the computer, otherwise, just plugging a card in won't allow the card to mount. Even when it mounts, the speed of transfer was no better than Firewire 800 card reader. Rated 1 out of 5 by Anonymous from Not Compatible with MAC OS 10.8 The company has no plans to write a driver for Mountain Lion (MAC OSX-10.8) - I just talked with them. It is likely compatible with the previous OS (older Lion OS). Rated 4 out of 5 by Klebernina from Works as promised on OSX 10.9.2 Be sure to download the latest drivers:(RocketU_Dual_USB3.0_for_Mac_105_109_v1.1.0_14_01_15.dmg) at the High Point website. Easy set up. Recognized by OSX. Ready to work. Yes, hot swap as promised, for both my WD My BOOK and Seagate USB 3.0 external HD's. My PNY 32GB USB 3.0 pen-drive works fine if plugged directly. Unfortunately, my Dynex USB 3.0 Port Hub model DX-U34H41 not supported. Since I do not let my System HD hibernate, I don't know if the HD's connected to the board need any help (pluging/unpluging) to be back to work after the system wake up. Rated 5 out of 5 by Flashpixfilms from High Speed and great price for MAC Very simple installation and worked right out of the box. A simple and inexpensive way to add high speed downloading of my large digital camera files into the computer--without the expense of going to thunderbolt. Way faster than Firewire 800 when paired with Lexar USB 3.0 card reader. A good upgrade investment on my 2008 Mac Pro tower. Rated 3 out of 5 by Bobalu from Fast and easy, but...... I bought this to use on my MacPro. Works with my Lexar USB3 dual card reader as well as a USB3 portable hard drive. After driver installation, I lost my circular eject icons for all of my drives and cards, in the sidebar on OS 10.5.1. Their support access is clumsy and the response I got from them missed the issue completely and there was no way to write a response. It is fast and it works, but it messed with the Mac OS inerface and that is an inconvienience. Rated 1 out of 5 by Jon from Will not work with card readers I wish B&H would list this in the product features and have this cruital feature not hidden away in reviews. Why even make somethin so useless? The HighPoint RU1022AM RocketU Dual USB 3.0 for Mac will be compatible with the original Mac Pro providing you are running Mac OS X 10.5 or newer. Note that you will not see the full speed of USB 3.0 as that computer uses the original PCIe spec, not v2. This will max out the cards speed at about 2,000Mbps.